Sitting down here and waiting for someone from Jos since yesterday, I suddenly realized the unjust arrangement in this combination called Nigeria. Travelling to Ghana in a bus from Lagos is nearer than travelling to Jos in a bus. How come they say we belong to one nation when we are uncountable poles apart? Where has the oneness been reciprocated? We are worlds apart without resemblance of any sort. We are different in everything and everyway. For the love of our oil wells, rich, grassy and fertile farmlands, they condensed to making an impossibility possible; it is not going to succeed. Britain's desperate desire to remain in Biafra region, milking her dry indirectly by dividing and ruling, through nook and cranny, had practically selected the radicalized religious bigots who were and still are blood-thirsty to handle the oars of Nigeria, this is to the detriment of Biafra where the main source which remains her economic manpower is situated. How can it be that we are governed and cheated out of our wealth by strangers from far-away? We are not bastards, we have origins, we are not bought slaves but people with capacities, we are a force to reckon with. How then can we gently watch our rights slip away to far-away strangers, who can never love us but sees us as enemies and hindrances to their unfortunate exploits? It is high time we think twice about our stand on Biafra. If it takes two days to travel from Lagos to Jos, how come the North is claiming ownership of oil in the East? This is the full height of criminality. The people should realize that the North is another country and should remain in their territory; the West, like wise. Our languages and intermarriages has tangled many but it is advisable to note the difference in all these. There is absolutely everything wrong in this arrangement. Let Biafra go, The gap is too farther and can never be bridged. The depth is just as unending as the abyss. There is no need to continue the pretense, hypocrisy of all sorts must cease. There is no need for one Nigeria that only benefits a parasitic region, holding onto power like the drug dealers running a drug empire. Nnamdi Kanu saw and forecasted all these and we are still creating more awareness to let the world know of the partial arrangement called one Nigeria. Neither restructure nor negotiation is acceptable; all discussion will only end up in futility. I will never use my left hand to point and Identify my father's house. In Biafra we stand, her creed we will rehearse, her laws we will obey. 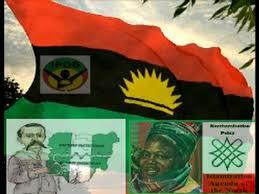 In Biafra we hope, her prospect we will pursue; her will we will acquire, her future we must secure. In Biafra we stand, persecution will not be her downfall but her energenizer, suppression will not stop her words from flowing nor our pens from writing.